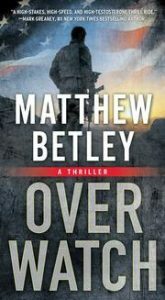 If you enjoy reading spy thrillers from authors like Brad Thor and Vince Flynn, then you need to pick up Matthew Betley’s Overwatch. It’s a phenomenal debut thriller! I especially enjoyed reading the fight scenes from multiple perspectives, including both the good and bad guys. You’ll be able to see the action unfold from each participant’s viewpoint, which really brings it all to life in your imagination. With a frightening plot, and non-stop action from start to finish, this is one you won’t be able to put down! o.ver.watch 1. The process of watching from a high position another group of soldiers who are involved in a military activity and giving them support if necessary. When Logan West impulsively answers a dead man’s ringing phone, he triggers a global race against the clock to track down an unknown organization searching for an Iraqi artifact that is central to a planned attack in the Middle East—one that will draw the United States into a major conflict with Iran. Logan, a former Marine officer, is quickly contracted as a “consultant” to assist the FBI as part of a special task force bent on stopping the shadowy operatives, whatever the cost. The battles are nonstop, from the plains of the Midwest, to mansions in northern Mexico, to the war-torn Al-Anbar province, pitting an international team against trained mercenaries employed by the world’s largest private security contractor…whose owner has a personal vendetta against the US government. Meanwhile, Logan is battling his own demons, especially the trauma of the ambush that his Force Recon unit suffered at an insurgent torture compound in Fallujah in 2004, which threatens to destroy everything he holds dear. Matthew Betley is a former Marine officer of ten years. 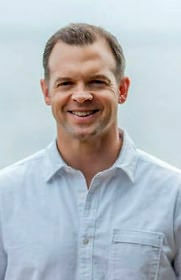 His experience includes deployments to Djibouti after September 11, and Iraq, prior to the surge. A New Jersey native who considers Cincinnati home, he graduated from Miami University in Oxford, Ohio, with a B.A. in psychology and minors in political science and sociology.